Joelle King deservedly won a first major title in Hong Kong a few days ago, while runner-up Raneem El Welily took the World No.1 spot. In the meantime, Mohamed ElShorbagy confirmed he's the boss of men's squash after a couple of unexpected defeats. 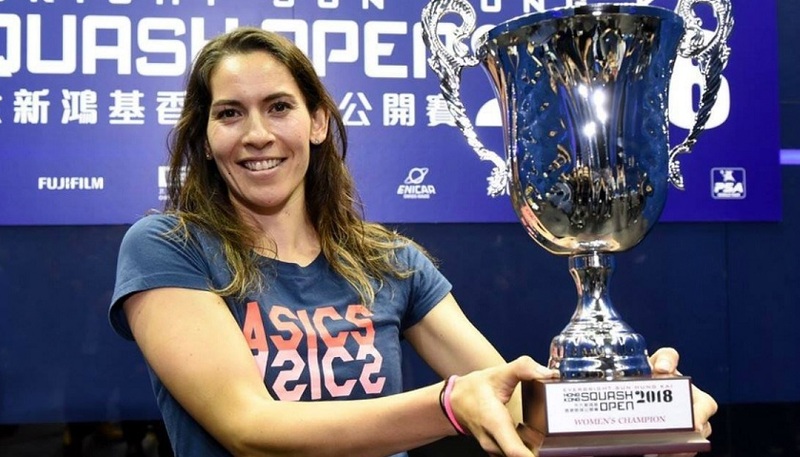 There will be several things to remember from the 2018 women's tournament in Hong Kong: since Laura Massaro's wins at the British Open and World Series Finals at the spring of 2017, no non-Egyptian player had won a major tournament. Coming through as the victor after 3 hard fought games against Raneem Welily, Joelle King also won the first ever Platinum (formerly World Series) event of her carrer, at 30 years old. After a very successful past season - she was runner-up at the Windy City Open and gold medalist at the Commonwealth Games, see blog of the 27th of April 2018 - the Kiwi had not started 2018-2019 in the same fashion before her superb run in Asia, where she beat Nour ElTayeb, Sarah-Jane Perry and El Welily. 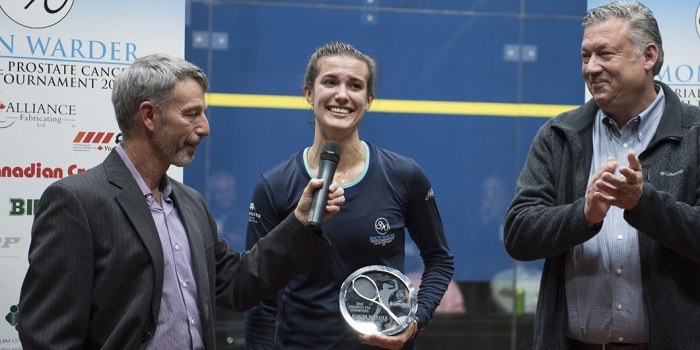 “I’m just extremely happy to win my first platinum event ever,” said King, who qualifies for the season-ending PSA World Tour Finals as a result. “It hasn’t really sunk in yet, but to be on a stage like this, with such great fans means a lot. I just want to go on from here and keep playing good squash. I just kept thinking that it’s the last match of the tournament – just leave it all out there. Raneem is such a tough competitor and she showed in the third game - which King won 19-17 - why she is now No.1. 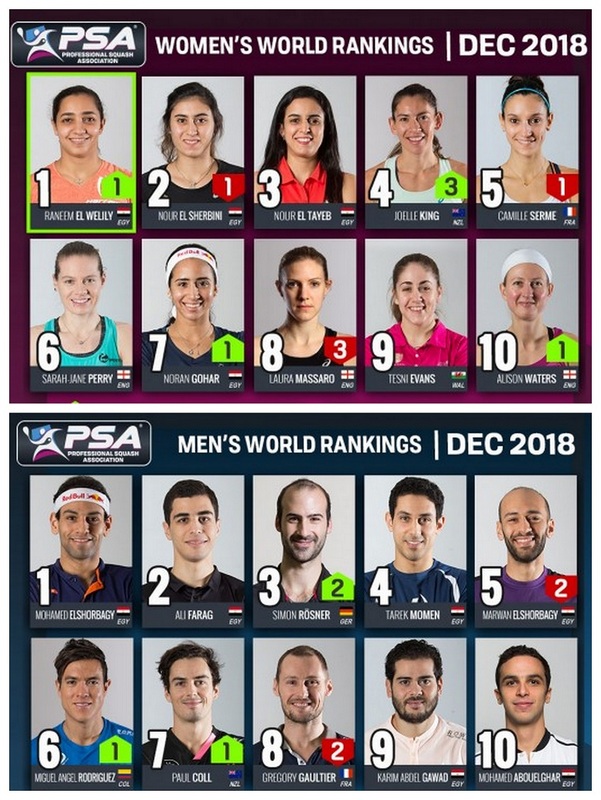 She just kept coming back at me and never let it go until the end.” This was the other big outcome of the week: after a 31 month uninterrupted reign Nour ElSherbini lost the No.1 spot to the benefit of her compatriot in the new world rankings which were published yesterday (see below). She was ousted in the quarters by SJ Perry, while Nouran Gohar regained some form in HK: winner of the 2016 edition - her first and only major win to date - the former World Junior Champion hadn't featured in the semifinals of a Platinum event since January. 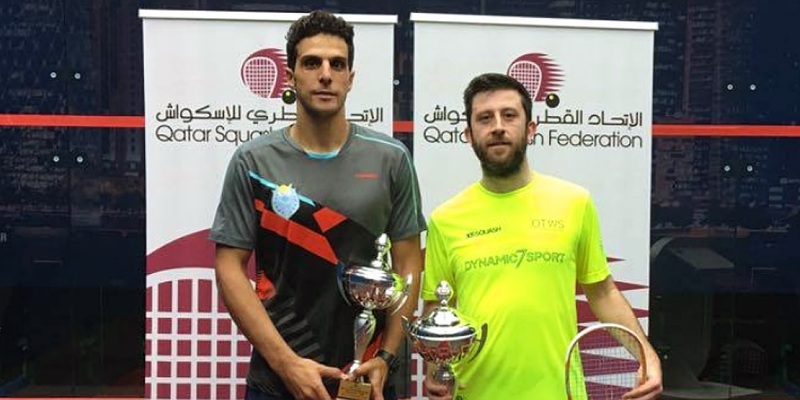 Daryl Selby lifted his first PSA Tour title in over two years after he overcame top seed Omar Mosaad in the final of the QSF No.1. The Englishman, who celebrated his 36th birthday a few weeks ago, last tasted title success on the PSA Tour at the Macau Open in September 2016, but he put together a fine run of form in Doha to defeat Finland’s Olli Tuominen, Qatari No.1 Abdulla Mohd Al Tamimi and Scotland’s Greg Lobban to reach the title decider. Mosaad, a former World No.3 and a World Championship finalist in 2015, led the pair’s head-to-head record by five wins to Selby’s one coming into the final, but Selby took a close first game (11-9) and never looked back, sealing his 13th career PSA Tour title and the biggest share of the $51,000 prize purse. “This was probably my best match,” Selby told the Qatar Tribune. “The first game was crucial for me. I put pressure on him and I didn’t let him play his game today. I am glad I managed to get it done. It’s my first title in a long time and I didn’t expect to win." Daryl Selby is using the Black Knight Ion Element PSA squash racquet. 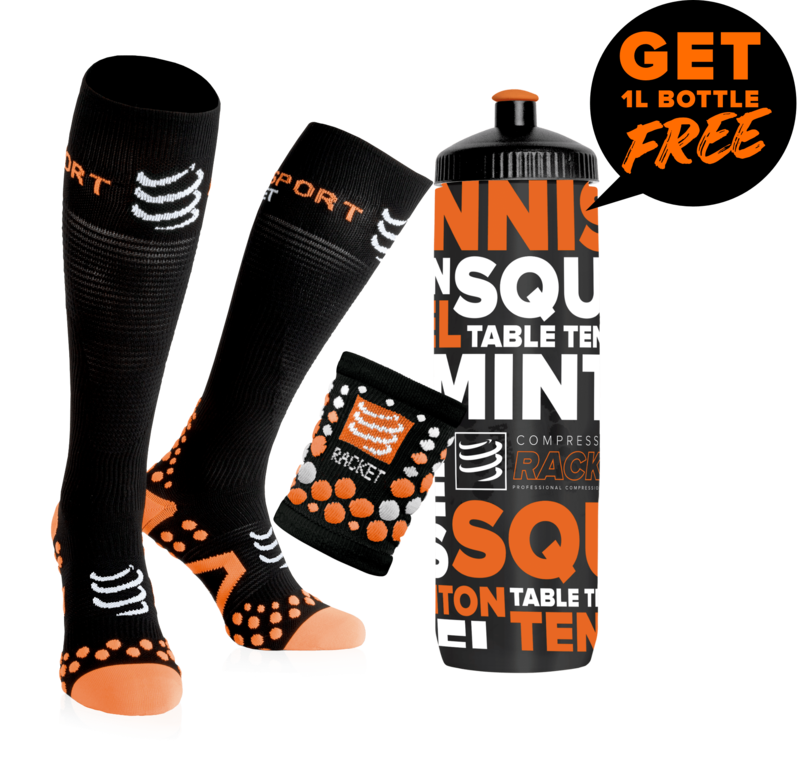 Discover the whole range of Black Knight squash racket, available on My Squash. Another Bronze tournament ended in Pakistan today, and Karim Abdel Gawad prevailed over Diego Elias in the final. It's the first title in 18 months for the 2016 World Champion. After Dimitri Steinmann, Christine Nunn and Todd Harrity at the beginning of the season, five other players have booked their ticket for the PSA World Championship (19-21 February in Chicago), whose prize money of 1 million dollars will be the biggest of squash history. Canada's Samantha Cornett and Pakistan’s Shahjahan Khan were victorious in Sarnia, Canada, while Egypt's Menna Hammed and Youssef Ibrahim will join them in the US thanks to their respective wins at the PWC Open in Frick, Switzerland and the Romanian Open. It was the fourth consecutive title for the left-hander who saw his 21-match winning streak come to an end a few days later in Pakistan. The latest qualifer is Melissa Alves, who won the Val de Marne Open 2018 in Paris. Both draws in Chicago will comprise of 56 PSA entrants and one wildcard, with the other seven places taken up by winners from the selected tournaments on the PSA Challenger Tour in the so-called ‘Road to Chicago’ competition. 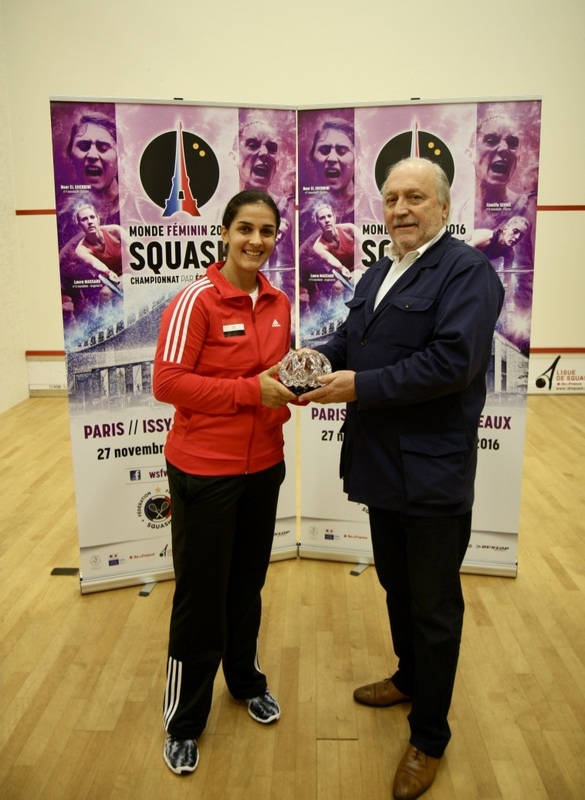 Egypt’s Raneem El Welily has become the new women’s World No.1 after the PSA Women’s World Rankings for December were released yesterday. El Welily became the first female Egyptian in any sport to become World No.1 when she ended Nicol David’s record nine-year reign at World No.1 back in September 2015. She then topped the rankings for four months until surrendering the spot to England’s Laura Massaro in January 2016. But her run to the final of the Hong Kong Open last week – coupled with a quarter-final defeat for compatriot Nour El Sherbini – means that the 29-year-old has once again claimed the coveted World No.1 spot, ending El Sherbini’s 31-month reign in the process. El Sherbini drops to No.2 ahead of compatriot Nour El Tayeb, while New Zealand’s Joelle King rises three places to No.4 after she beat El Welily in Hong Kong to win her first PSA World Tour Platinum title. France’s Camille Serme completes the top five. Elsewhere, Sarah-Jane Perry (No.6) becomes the new England No.1, with the previous holder of that honour – Laura Massaro – tumbling three places to No.8 to record her lowest ranking since March 2011. Nouran Gohar rises to No.7, while Wales’ Tesni Evans and England’s Alison Waters close out the top 10. Malaysia’s eight-time World Champion Nicol David drops out of the top 10, falling two places to No.12. Germany’s Simon Rösner has risen two places to a career-high World No.3 ranking. After runner-up finishes at October’s U.S. Open and last month’s Qatar Classic, his run to the semi-finals of the Hong Kong Open has enabled him to leapfrog World No.4 Tarek Momen, while Mohamed ElShorbagy tops the rankings for a 10th successive month ahead of Ali Farag. Marwan ElShorbagy drops two spots to No.5, while Colombia’s Miguel Angel Rodriguez and New Zealand’s Paul Coll both move up a place to No.6 and No.7, respectively. Former World No.1 Gregory Gaultier, who is currently injured falls two places to No.8. Egyptian duo Karim Abdel Gawad and Mohamed Abouelghar complete the top 10. James Willstrop is on the rise as he moves up three places to No.15, overtaking compatriot Declan James to reclaim the men’s England No.1 spot. After claiming the QSF No.1 title last month – his first title in two years – England’s Daryl Selby has enjoyed an eight-place increase to No.16, with Germany’s Raphael Kandra moving up three spots to a career-high No.17 ranking. Three-time World Champion Ramy Ashour has dropped out of the top 20 for the first time since September 2006. The Egyptian maverick is yet to appear on the PSA Tour this season due to injury. --- World No.1 Mohamed ElShorbagy, winner of the Hong Kong Open a few days ago, will look to keep his momentum going when he opens up his CIB Black Ball Squash Open campaign against Hong Kong’s World No.14 Max Lee on Tuesday. 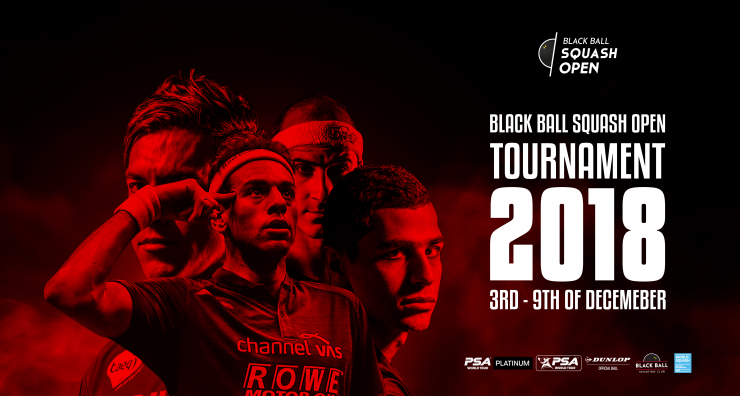 The first ever edition of the PSA World Tour Platinum tournament takes place between December 3-9 at the Black Ball Sporting Club in Cairo, and is the first major tournament to take place in Egypt’s capital since the men’s 2016 PSA World Championships. ElShorbagy is supposed to clash with Karim Abdel Gawad in the quarters, but the former world champion could meet Diego Elias in the round of 16. Mohamed Abouelghar and Tarek Momen are also featuring in the top half of the draw. World No.2 Ali Farag is seeded to meet ElShorbagy - who beat him in the final in HK - in the title decider but faces a number of difficult challenges en route, with the likes of World No.5 Simon Rösner, World No.7 Miguel Angel Rodriguez and World No.8 Paul Coll all featuring on the lower half of the draw. Speaking to the PSA World Tour on their website, Farag says he is"thrilled to be playing in (my) backyard. It’s literally 15 minutes away from where I live, so I couldn’t have asked for a better setup. I am really looking forward to sleeping in my own bed and going on with a normal routine day while playing such a big tournament. I am obviously determined to do well in every tournament, but this one is extra special as it’s always a bonus to do well here in front of family, friends, coaches, sponsors and everyone that helps all year long. It’s a big thank you to everyone involved when they witness you do well live.” Ramy Ashour fails to feature at the event after withdrawing due to a persistent knee-injury which has prevented him from appearing at any tournaments this season so far while Mexican Cesar Salazar, Spaniard Borja Golan and Frenchman Mathieu Castagnet are also absent due to injury.